There's no better way to say, "Good luck on your school exams," than with citrus fruit pentagons, am I right? 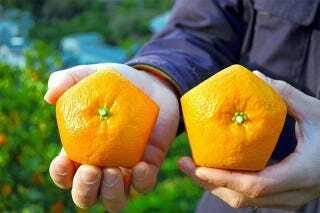 Fruit farmers in Ehime Prefecture, Japan have created "Gokakukei Iyokan" (五角形イヨカン). A mix of mandarians and oranges, "iyokan" is sometimes called a "Japanese Summer Orange." And in Japanese, "gokakukei" (五角形) means "pentagon." But this special fruit's name is a pun! See, "goukaku" (合格) means "successfully passing an exam." And "ii yokan" (いい予感) means a "good premonition." So, if written like "goukaku ii yokan" (合格いい予感), it means "to have a good premonition of exam success." Clever! Since we are coming up on the big exam period for high school students hoping to get into the right university, giving one of this oranges would be a pun-filled way to offer encouragement. Courtesy of Asahi News and website Pouch, you can see more photos of the pentagon-shaped fruit as well as how they are grown into that pentagon shape. The farmers have been working on this for years! No idea how long it took them to come up with the pun.